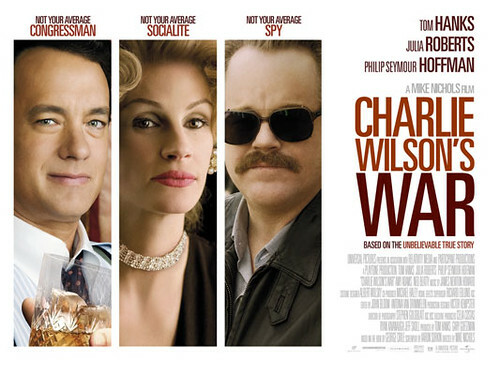 Charlie Wilson's War: 7 out of 10. I liked Charlie Wilson's War. Tom Hanks was very good and Philip Seymour Hoffman stole the show, but everything that damn Julia Roberts showed up, it started to piss me off. I just don't like Julia Roberts. But Philip Seymour Hoffman... damn, this guy is worth his weight in gold. She is the WORST. I'd rather listen to Pearl Jam. Where is your links page? It's funny, but five years ago yesterday I wrote http://www.torontomike.com/2003/12/i_hate_julia_roberts.html . LOL! That is the GREATEST post ever. Next time you're bored, Google I hate Julia Roberts - that entry is in the top five. This movie was OK at best. Philip Seymour Hoffman did steal the show. Hey Rod - I HATE JULIA ROBERTS! I love Charlie Wilson, so I can't judge the movie, I would love it even if it was the worse ever as long as it concerns that fantastic guy Charlie. I would give him my heart if I was not over the hill. Really!